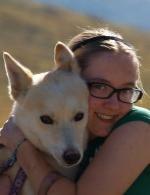 Meredith Mapes, 17, began mushing at the age of six through Girl Scouts. She has completed the Jr. Iditarod three times, her best finish, 6th in 2010. “This will be my final Jr. Iditarod, and I look forward to taking all that I have learned from my dogs and my friends into my future. I have learned independence, courage and to persevere from dogs, and I know that this experience will serve me well in the years to come. Thank you to all my friends, sponsors and family members who have helped me, pushed me and cheered me on these last few years. It’s been a great ride!” A senior at Palmer High School, Meredith participates in soccer, skiing and choir.” She also enjoys reading, computer, music, snowboarding, and photography. She plans to go to college after graduation and says that “maybe” she’ll continue mushing.